Anyway, cookies are a universally loved form of carbohydrate. If you don't love a cookie every now and then, well... I just don't think we could be friends. There is just something so warm and comforting about a good cookie, especially the scent of a freshly baked batch. Demeter knows what I'm talking about. 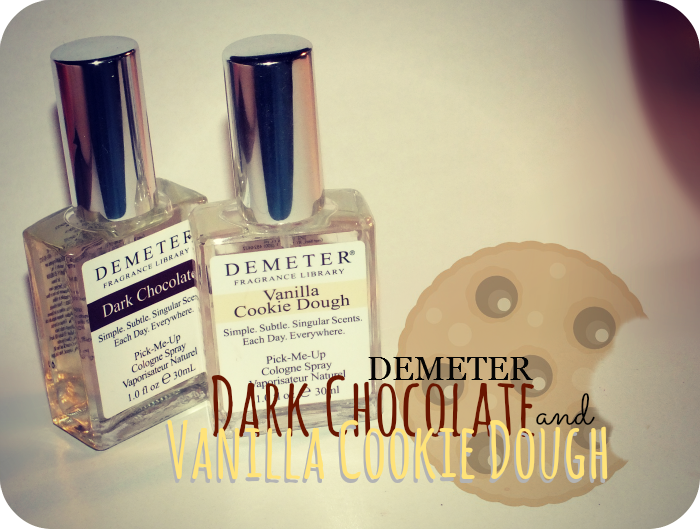 With their Dark Chocolate and Vanilla Cookie Dough scents you can make your own custom cookie blend. 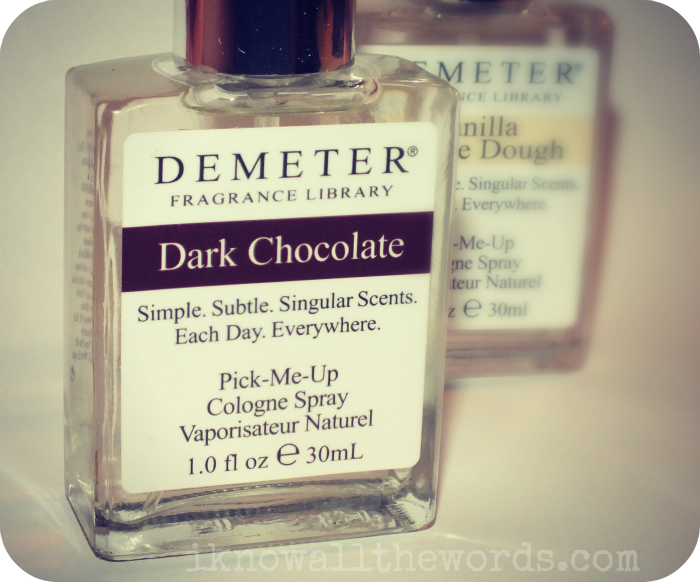 'Deep, rich and exotic, Dark Chocolate by Demeter Fragrance Library is a silky smooth, absolutely sensual and indulgent chocolate fragrance. I wasn't sure that a chocolate scented perfume would something I'd like- don't get me wrong, I love chocolate, especially dark, but do I want to smell like it? Yes, Yes I do! This is not a sickly sweet take on chocolate, but there is more sweetness than I expected. When first sprayed you get the sweet notes- I'm not quite sure what they are exactly, but as it dries down, you get the warmer, slight bitterness of dark cocoa. 'It’s difficult to find descriptive words for this scent after "Yummy". 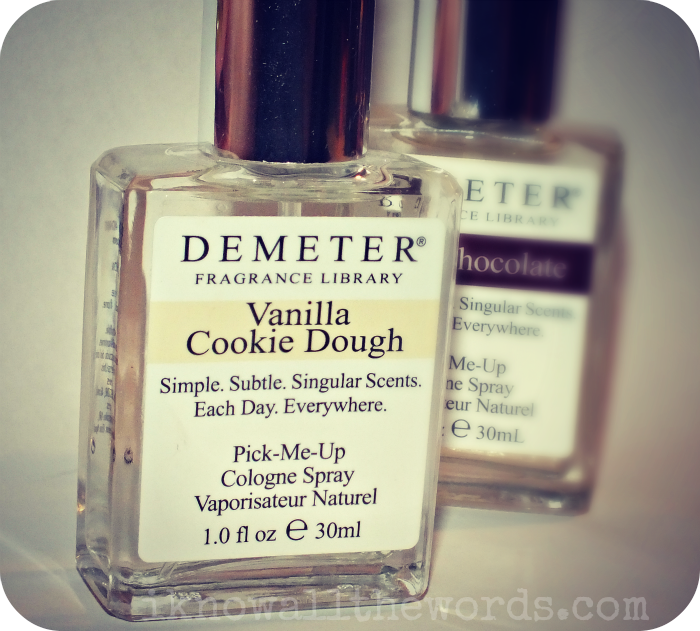 Demeter's Vanilla Cookie Dough is dense, delicious and full-bodied – a Vanilla lover's delight, but without the cloying sweetness that vanilla fragrances can develop. This scent is a hands down must for vanilla fans! Vanilla isn't always done right when it's the main scent in a fragrance, but this is so lovely. The scent isn't solely vanilla, there is a light sweetness that reminds me of almond/amaretto when first sprayed. As that begins to fade, the creamy vanilla notes take over. A simple scent but really very nice. Out of the other vanilla based Demter scents I've tried, this is my favourite. 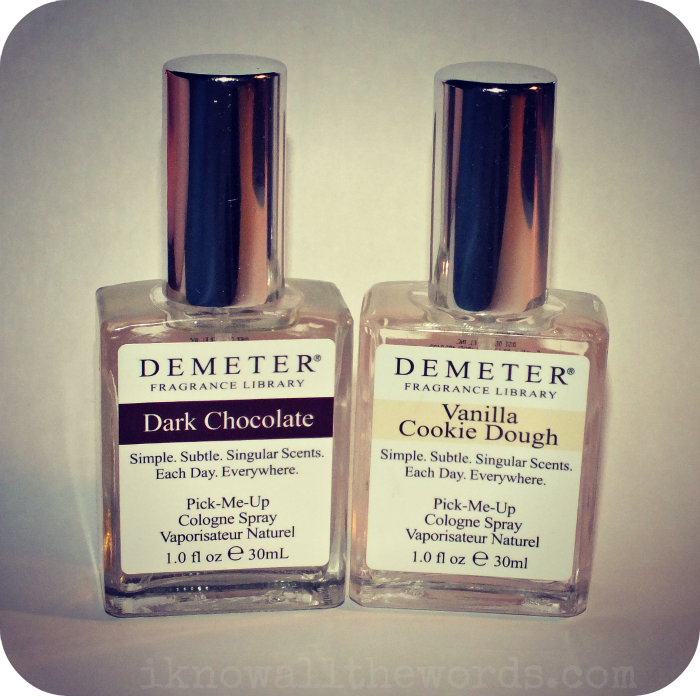 By applying both of these scents, you can create your own chocolate chip cookie scent. I like to do a 2 to 1 blend by spritzing two parts Vanilla Cookie Dough with one part Dark Chocolate for a nom worthy scent. If you love gourmand scents, these are two fragrances you definitely need in your collection! Do you like foodie scents? What type are your favourite?